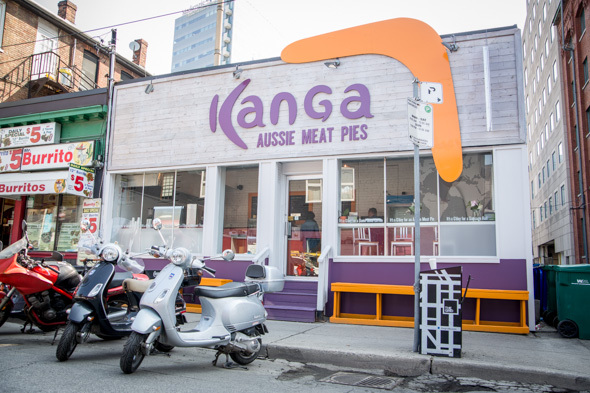 Kanga Aussie meat pies were, until now, only available at a handful of retailers or at the occasional food fest or pop-up market. 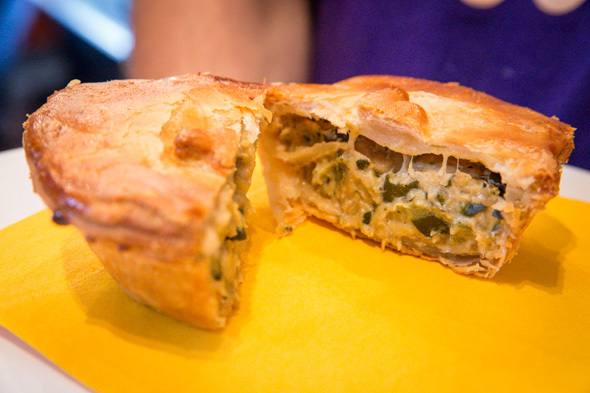 Now with a bricks and mortar address on Duncan, the flagship take-away outlet from chefs Megan Chan and Erynn Mayes will permanently make hand-held pies available for breakfast through to late-night snacking. 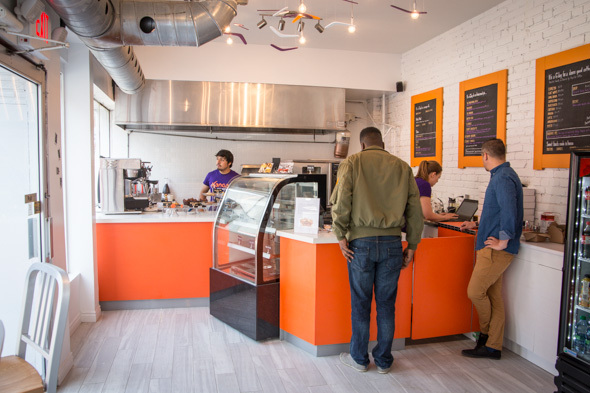 Taking over the former home of Fusia Dog, the wide but shallow space is equipped mainly for quick grab and go. There's limited rail seating at stools facing out the window, while a bench lines the exterior facade. On display are mini pastries, distinguished from British or American pies by a sturdy but incredibly flakey all-butter crust that fully encases a saucy centre to enable utensil-free eating. They're intended to be consumed like a hamburger. 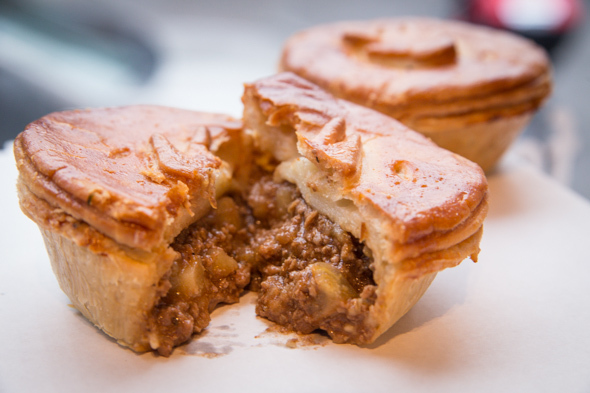 Traditionally, the pies are filled with minced beef and rich gravy, which of course is on the menu ($6.99) and best eaten with tomaaaato sauce (a.k.a ketchup). Other variations include the Butter Chix ($6.75), filled with creamy tomato curry, and the El Diablo ($7.50), which is stocked with pulled pork, BBQ sauce and fluffy mashed potatoes on top. My favourite, the Creamy Zucchini ($6.50), is actually meatless, filled with roasted zucchini, caramelized onions and a garlicky cream cheese sauce. 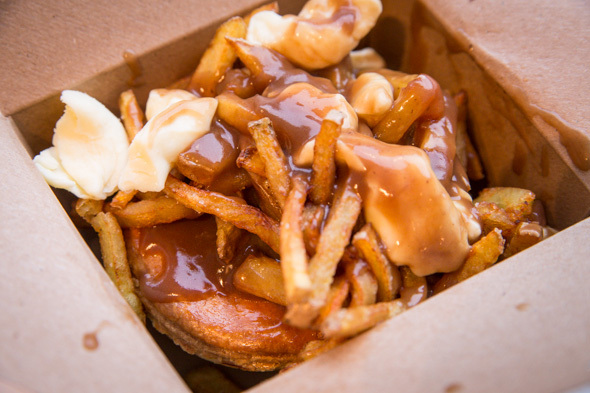 Poutine on the menu is both a noun and verb, as in "I'll have a poutine" or "go ahead and poutine my pie." Neither answer is wrong and going without might actually be a disservice. My sober self doesn't even like poutine but this might be the exception. The house gravy is exceptionally good, made with an Australian Shiraz reduced down to a rich sauce that's doused over squeaky cheese curds, expertly seasoned fries, pie and all. Other specialties from Down Under include sausage rolls made from Sanagan's sausages and spinach rolls. 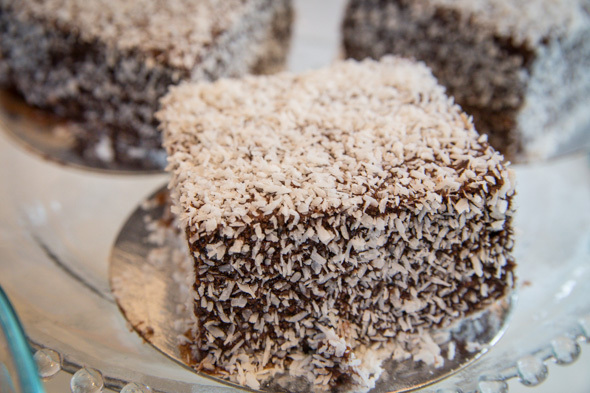 A selection of baked goods includes Lamingtons , a moist sponge cake covered with chocolate and coconut. 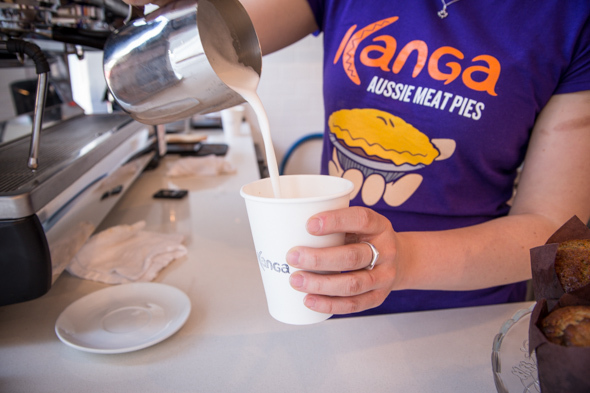 Kanga is open weekdays from 7am to offer breakfast pies and Aussie coffees like long blacks and flat whites pulled from locally roasted Propeller beans. From Thursday through Saturday, the plan is to stay open until 3am.